Almond milk may be marketed as a substitute for dairy milk, but it's not entirely nutritionally equivalent. When you're trying to lose weight, both almond milk and skim milk have distinct advantages. 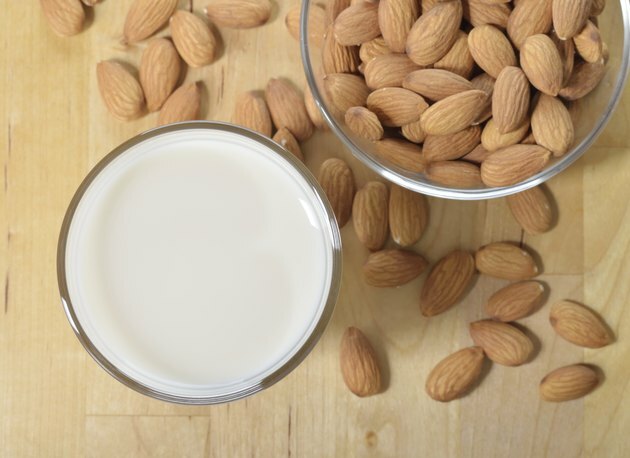 Almond milk is lower in calories, which makes it easier to fit into a calorie-controlled diet, but milk has more calorie-burning protein and more evidence linking it to fat loss. Go with your personal tastes and choose the one that helps you enjoy a calorie-controlled diet for long-term weight loss success. Find out more about the exact nutrition breakdown of almond milk and skimmed milk on MyPlate. No matter which foods and beverages make up your diet, you'll need to burn more calories each day than you eat, so your body will start to burn fat to close the calorie gap. Safe, sustainable weight loss involves losing 1 to 2 pounds a week, which means burning between 500 to 1,000 calories more than you eat daily. Almond milk and skim milk share one disadvantage for weight loss: They are a source of liquid calories. Liquids don't generally help you feel full, according to the Harvard School of Public Health, so you're consuming calories without getting the appropriate "full" feeling to go along with them. Try to get most of your liquid calories from calorie-free fluids, like water, and drink sources of liquid calories in moderation. While almond milk does contain calories, it's lower in calories than skim milk, which gives it an advantage for weight loss. A cup of unsweetened almond milk has just 39 calories, compared to 91 calories in a cup of skim milk. If you're drinking a glass of milk every day, switching to unsweetened almond milk, you'd save almost 19,000 calories over the course of the year. That's the equivalent of more than 5 pounds of fat you'd lose, without making any other adjustments to your calorie intake or diet. However, sweetened almond milks are much higher in calories, so they won't offer the same weight loss benefit over skim milk. A cup of sweetened vanilla almond milk, for example, has 91 calories -- the same as a serving of skim milk. Skim milk has a weight loss advantage over almond milk when it comes to protein. A 1-cup serving has 9 grams of protein, while almond milk has less than 2 grams of protein per cup. Protein digests slowly, and it takes a lot of energy to break down -- a phenomenon called high thermic effect. Because of its higher protein content, your body actually burns more calories digesting milk than almond milk. There's also some evidence linking dairy consumption to fat loss. A study published in the British Journal of Nutrition in 2015 looked at the results of several prior studies to determine if there's any connection between dairy intake and body weight. After studying the results of 41 studies, the researchers found that, while dieters who consumed three servings a day of dairy didn't lose weight, they did lose body fat. As of October 2015, no scientific evidence links almond milk to weight loss or fat loss. Skim milk and almond milk can fit into a weight loss diet, as long as you still get most of your fluids from water. Both drinks are in the dairy food group under USDA ChooseMyPlate guidelines, and the USDA recommends 3 cups of dairy foods each day. When you're shopping for unsweetened almond milk, look for varieties that come fortified with calcium -- skim milk provides roughly one-third of your daily calcium per serving, so if you're replacing it with almond milk, you'll want a variety that has a similar calcium level. If you need more flavor in your almond milk, make a sugar-free iced almond "chai latte" by steeping a bag of chai tea in a cup of almond milk in the fridge overnight, or mix vanilla extract into your almond milk for a vanilla-flavored beverage. British Journal of Nutrition: Effect of Increasing Dietary Calcium Through Supplements and Dairy Food on Body Weight and Body Composition: A Meta-Analysis of Randomised Controlled Trials. What Drinks Should You Drink to Help Lose Belly Fat?